Not to be confused with Bazooka. Artwork of a Bazuka from Donkey Kong Country 3: Dixie Kong's Double Trouble! Bazukas are red Kremlings that are encountered in the games Donkey Kong Country 3: Dixie Kong's Double Trouble! and Donkey Kong Land III. Their name is a play on "Bazooka", which is a very big gun. They wield large bazookas (hence the name) with laser sights, and bear a passing resemblance to Kopters. Bazukas have spiky crests on their heads. This feature, along with its red coloration, gives them a dragon-like appearance. They are the game's equivalent of Kannons, shooting barrels in a pattern, or crazily in one direction. Bazukas can shoot all kinds of barrels, including TNT Barrels or Steel Kegs, and bouncing on their projectiles is often mandatory to cross gaps or to reach Bonus Areas. In several levels, a Bazuka is needed to reach that level's DK Coin: Dixie Kong and Kiddy Kong must lure him into shooting a Steel Keg at a Koin. 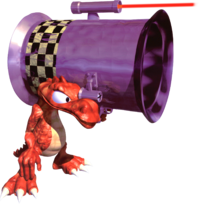 Bazukas can't hurt the Kongs directly, but their barrel cannons protect them from Dixie and Kiddy's direct attacks, along with Squitter's webs. However, Bazukas can be defeated by throwing a TNT Barrel at them. According to the game's credits, Bazukas belong to the "Kremling Kreeps" enemy class. Bazukas first appear in Blazing Bazukas, the fourth level of Mekanos, which sees the Kongs making their way through a large factory infested with those barrel-shooting Kremlings. In a level of Krematoa, called Criss Kross Cliffs, Bazukas are necessary, as one at the bottom of the level fires Steel Kegs continuously up. Dixie and Kiddy have to leap onto them as the barrels pushed them upward. At times, they can change the barrels from wooden to metal or TNT, utilizing switches throughout the stage, to clear the way of Red Buzzes and other obstacles. In Donkey Kong Land III, Bazukas are seen in all four factory levels - Karbine Kaos, Bazuka Bombard, Kuchuka Karnage, and Barrel Boulevard. Strangely, there are not many Bazukas in "Bazuka Bombard". They are also in two of the jungle levels: Jungle Jeopardy and Tropical Tightropes. In this game, it is impossible to defeat a Bazuka, since TNT Barrels are not found near any Bazukas. Sprite in Donkey Kong Country 3: Dixie Kong's Double Trouble! This page was last edited on September 7, 2018, at 12:44.